Your mouth is the gateway to the rest of your body, and healthy teeth and gums are important for continued overall health and wellbeing. 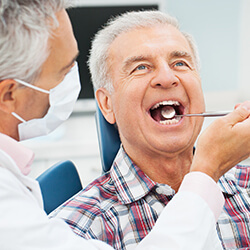 Gum disease takes a major toll — it has been linked to heart disease, high blood pressure, uncontrolled diabetes, premature birth, and other serious health effects. Scaling and root planing and antibiotic therapy heal periodontal infection and prevent reinfection of the gums. If you have bleeding, tender, red gums, it is time to visit your dentist in Atlanta, Dr. George Michaels. In its beginning stages, gum disease can be reversed with improved hygiene at home and a couple extra visits to the dentist. But for moderate cases of gum disease, Dr. Michaels will recommend scaling and root planing, also known as a deep cleaning. To perform this nonsurgical treatment, we use special tools to remove bacteria around and just below the gum line. Scaling cleans bacteria and plaque from the tooth and the pocket between it and the gums. Then planing smoothes the inflamed root to prevent reinfection. 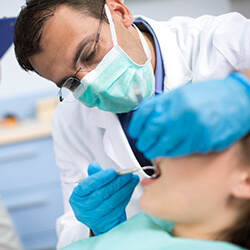 The total length of treatment depends on the severity of the infection, but scaling and root planing is usually carried out over three to four visits to the dentist. It may be combined with antibiotic therapy (see below) to fully heal your gums of the infection. Local anesthesia is available for your comfort during each scaling and root planing treatment. The bacteria that causes gum disease grows rapidly and may multiply more quickly than it can be treated with scaling and root planing. When periodontal therapy on its own is not enough, Dr. Michaels may choose to supplement deep cleaning treatments for gum disease with antibiotic therapy to fight recolonization of the specific bacteria that causes gum disease. 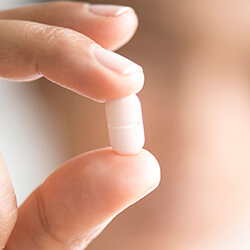 At Midcity Dentistry, we use the antibiotic Arestin to achieve and sustain healthier levels of bacteria in your mouth. Dental caries, or cavities, are the most common disease for adults and children. They are caused by harmful bacteria in the biofilm (plaque) that covers your teeth. To prevent cavities, we want to kill the bad stuff in the biofilm without getting rid of all the bacteria in your mouth. Yes, brushing, flossing, and using Listerine all help — but targeted antimicrobial treatment completely wipes out and prevents the repopulation of the bad bacteria that causes tooth decay and gum disease.